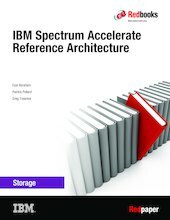 IBM® Spectrum™ Accelerate, a member of the IBM Spectrum Storage™ family is an agile, software-defined storage solution for enterprise and cloud that builds on the customer-proven and mature IBM XIV® storage software. The key characteristic of Spectrum Accelerate is that it can be easily deployed and run on purpose-built or existing hardware chosen by the customer. IBM Spectrum Accelerate enables rapid deployment of high-performance and scalable block data storage infrastructure over commodity hardware, either on-premises, or off-premises. This technical publication describes a Spectrum Accelerate implementation with Lenovo 3650M5 server hardware. Spectrum Accelerate can be deployed and run on purpose-built hardware chosen by the customer. This document is provided as a reference architecture and as an example for such a general-purpose hardware configuration. The IBM Spectrum Accelerate solution that is described in this document provides a total of 184 TB of usable capacity. The tested solution achieved peak performance of 440,000 IOPs and 3.4 GBps throughput.